Thank you in advance for any assistance, I tried the online tech support ROXIO offers and the system times out after 30minutes of waiting I get a message "waiting for agent..."
Any way when I got to capture video from YouTube, I tap Web Video then a message box pops up saying "LAUNCH YOUR BROWSER TO START VIEWING VIDEO..." So I launch. Browser and I still getting the same message: "Launch your browser..."
Also I have it installed on an ACER ASPIRE LAPTOP... I can provide more info on the laptop specifics if this would help? Josh, That function hasn't worked in earlier versions so I would not expect it to work for this version. There are alternatives. I like to use the free version of "Any Video Converter" to capture the videos. It seems to work on a lot of them. Remember that not all videos are downloadable. There are plenty of programs out there that do work. Look around and see what you can use. Does NXT2 have the green screen function in the video editor? I thought I saw a tutorial video that said it did... but its not to clear to me. If you biught it from Roxio/Corel, remember that they have a 30 day return policy. If you bought it elsewhere and explain the issue, then they may accept it back. I even had Fry's (US) accept back a program because it didn't work. I took some documentation with me. Roxio Creator 2012 was the last version before Corel took over Roxio. Some of us feel moving forward Nxt, Nxt2, Nxt3, had parts removed from Creator 2012 that shouldn't of been removed. 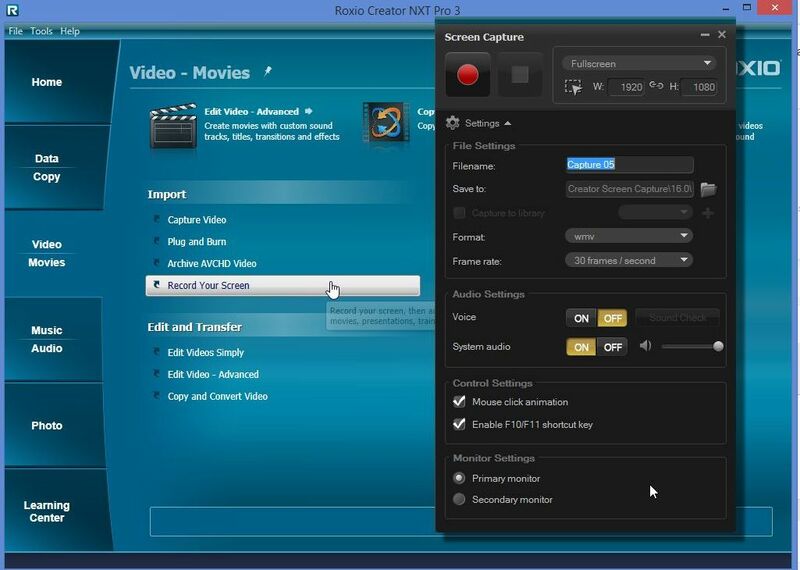 FYI the Screen Capture in Roxio Creator 2012 is as worthless as Nxt & Nxt2! Yes it has the green screen possibility. Go to the last tab on the Home page to select "Learning Center". Select Video- Movies. There is a discussion of green screen there. As you may know, green screen is very tricky. The green screen (or other color) need to be one color with no shadows caused by wrinkles or by lighting., hot spots, etc. or it does not look the way you think it should. Sometimes there are other ways of getting the effect you want. Can you give us more detail?